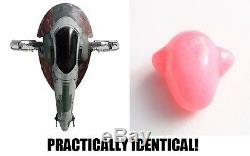 ULTRA Rare Slave 1 Shaped Jelly Bean. This is a once in-a-lifetime opportunity to get your hands on literally the ONLY one of these in existence! This is a never before seen, incredibly hard to find and incredibly hard to resist devouring BOBA FETT SLAVE 1 JELLYBEAN! Get it now before it's too late! WHERE ELSE IN THE WORLD are you going to have a chance at getting such an exclusive item as this? You will be the only person in the world to have one of these! I've been hoarding it in a sealed, padded plastic protective bag, covered in bubble wrap and sealed up in a safe since Easter, but the temptation to stuff it in my mouth and enjoy the sweet candy shell along with the chewy, gooey bean bits has finally become so great that I have no choice but to begrudgingly let it go. I'm hoping that it goes to an actual Star Wars fan who can appreciate the artistic design of this bean, and can really feel like you're Boba Fett himself (or maybe Jango Fett) while looking at it's incredibly detailed rendering of the Slave 1. I'm talking about the kind of fan who doesn't just have the movies on DVD or Blu-Ray, but instead insists on watching the old pre-1997 non-Special Edition VHS tapes where Han really did shoot first and Yub Nub was the song that closed out the trilogy! But I do understand that some men just want to watch the world burn. I'll try not to think about that too much. What you see in the pics is what you will receive! May the force be with you! The item "STAR WARS BOBA FETT SLAVE 1 ONE JELLYBEAN RARE ONE OF A KIND COLLECTIBLE" is in sale since Thursday, July 27, 2017. This item is in the category "Collectibles\Science Fiction & Horror\Star Wars\Products, Non-Film Specific\Other Star Wars Collectibles". The seller is "ocean-size" and is located in Pearland, Texas.